Not your typical postcard sunset, and it’s kinda chilly, damp and mucky in here, even as the temperature outside slides down to an overnight -15°C (5°F). But it’s all about the greens, tucked under a couple of layers of row cover, maybe not exactly cozy with only ground heat to keep them warm—who knows how they’re really feeling—still, well-set to survive another sub-zero night. With that in mind, sundown through 6 mil plastic is a cheery-enough sight to see! Great gloves get a little better! The greenhouse photo reminded me of those long days – many, many years ago – when we started our seeds and nurtured our seedlings early in the year, welcoming the warmth of the sun inside the long, pitched-roof, glass greenhouse (yep, THAT long ago); and then, when the days warmed considerably in early May, we longed for the days when we could take everything (including ourselves) outside for transplanting. Thanks for posting such a wonderful pic. I hope the wee plants weren’t shivering too much! Would you tell me what type of hoophouse you have and where you got it? We live in northern NY and it would be nice to get input from someone else who lives where it snows. 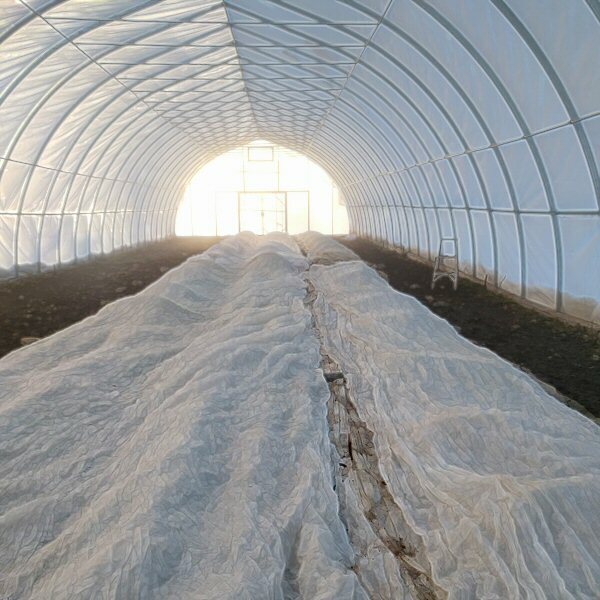 It’s 108×30, double-layered 6 mil greenhouse plastic (ends are single layer), on a 1″x3″ steel frame, set on a 6×6 wood beam, anchored with pounded-in 4′ T-bar and lag bolts, with roll-up sides for ventilation. The layers inflate with a squirrel cage fan (starts up reliably after power interruption), so needs electricity (I run a shallow-buried cable). Single layer plastic is cool, as well; double adds some cold protection, and lets snow slide off more easily (only one layer is up now in the pic, the second is waiting to go). If you search for “hoophouse” on this site, you’ll find lots of posts and photos of putting up the smaller one, which is exactly the same…just smaller (20×32). And there’s quite a bit of stuff elsewhere online, including useful videos. Unheated hoophouses are very fun! The bigger they are, the more stable the temperature (I’m just starting to learn about this first-hand), but any size at all is great to see what you can do with no other inputs, just weather. I think upper NY is pretty similar to here in Ontario. You should look around for a US supplier, for best price and service. Hope that helps!